I have a friend who insists that having a mattress protector is not important, and she was quick to tell me that it is a waste of money and I should just make sure to keep my blankets and sheets clean and avoid drinking or eating in bed. I am sure you might agree with her 100%, but there are those of you who will agree with me that it is a necessity. Remember that, a mattress is one of the items that you spent more time on while in your house and great care has to be placed on it to make sure that it is clean and comfortable for use. This protection is more than the occasional spills and crumbs of food. 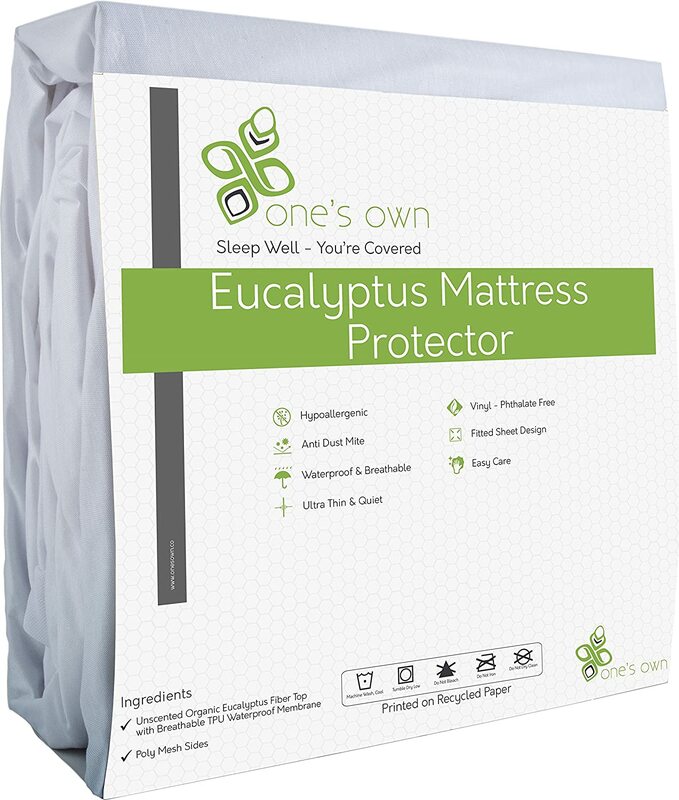 Natural Organic Eucalyptus Fiber Mattress Protector was bought by my friend and I got to learn from him that, it keeps the mattress in the best condition possible and even lengthen the life of the mattress. According to him, it is the ideal mattress protector, especially if you have any allergy or suffer from asthmatic or eczema. The mattress is said to have excellent moisture management which provides a comfortable layer of padding to your mattress to enable you to sleep comfortably. Moisture is wicked away and it allows skin perspiration to evaporate, leaving you dry. It is a breathable mattress cover, according to my friend, as it allows air to pass through keeping you cool and providing a more hygienic environment. It has no toxic – that is according to the short time he has used it, but am not sure if in the long run, it will have any effect on him. The manufacturer claims that it is void of any DNA changing toxins and it is eco-friendly due to the fact that, it is made from renewable natural fiber which follows the right sustainable practices. 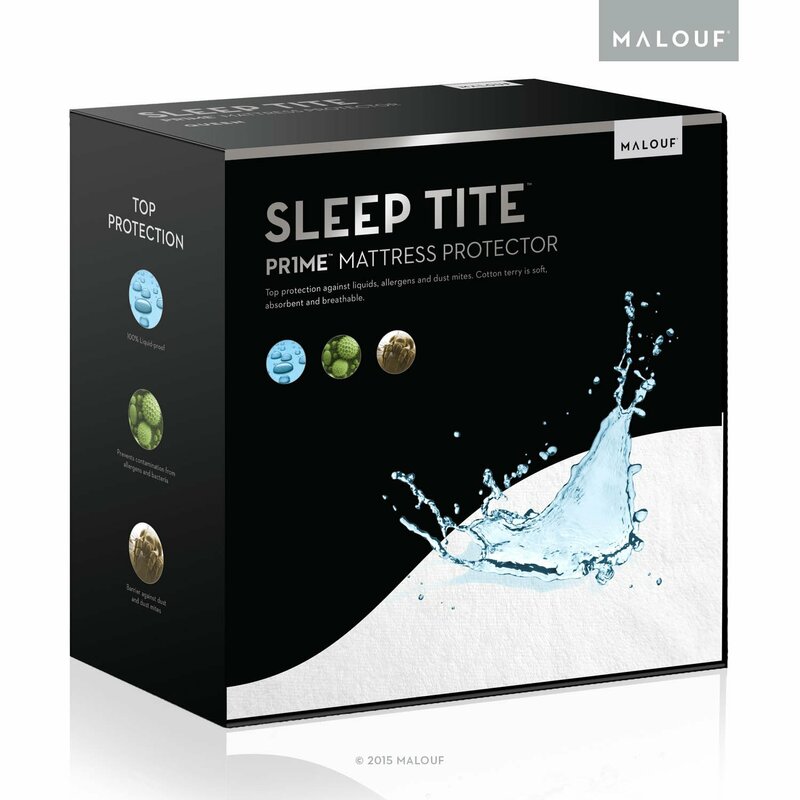 From the outside, the Sleep Tite Hypoallergenic Mattress Protector might look simple, but from my testing, it can really hold a lot of water, which could be as a result of accidents or bed wetting. It has a breathable and soft surface which will automatically help you to sleep comfortably. So if you have bought a new mattress in sizes Twin, Twin XL, Cal King, or Split King, you have an option of buying the sleep time, hypoallergenic protector. According to my testing, I found out that, it can protect the mattress from water and other spills thus, protecting the warranty. The manufacturer has packaged it nicely and it seems to be a neat design which is specifically designed to make it possible for you to sleep on a dry, clean, hygienic mattress for a very long time. I found it to be a cover that can be used by virtually anyone who is seeking protection and comfort. Although I tested the Queen size product, it is available in a variety of other sizes so no matter how big your bed is, you will get one to fit it. When I tried sleeping in it, the feel of the protector on my skin was very comfortable. It felt as if I was sleeping on a normal bed sheet instead of a waterproof, bacteria proof bed sheet. It felt soft and lovely on the skin for a comfortable and easy sleep. 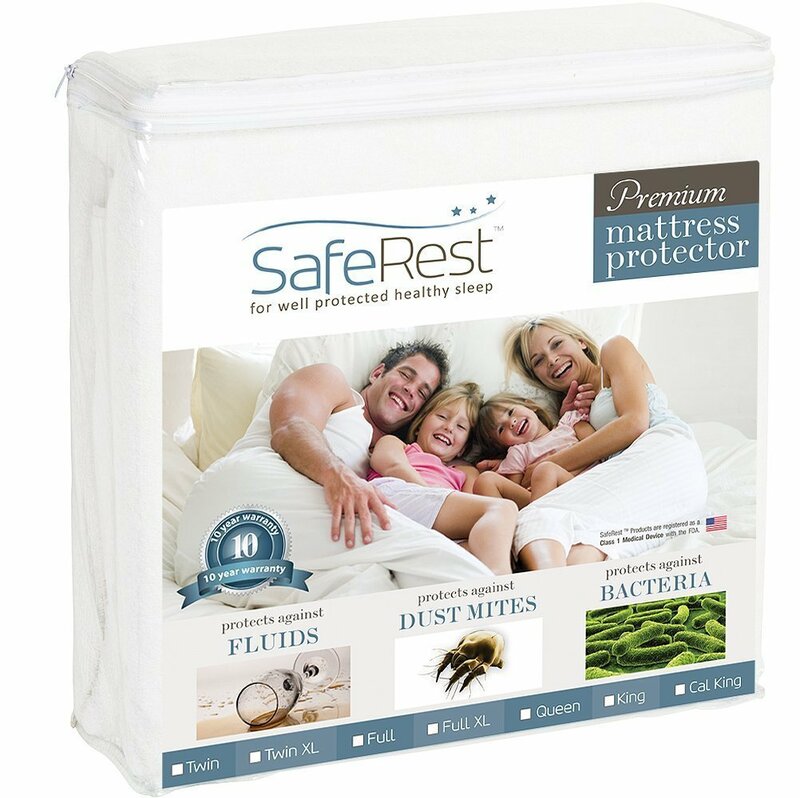 The Queen Size SafeRest Premium Mattress Protector is just among the many sizes you will be able to choose from when you buy a protector for your mattress from SafeRest manufacturers. I tested the cover and has the quality of protecting your mattress from perspiration, dust mites, allergens, urine and fluids of all types. It could be one of the best picks if you have pets, kids, allergies or incontinences. Remember that, during the time we are asleep, a lot of dead skin falls off from our bodies and which after accumulating, could form a conducive atmosphere for dust mites to breed and attack you. The protector is able to trap the allergens, skin cells and the dust mites to give you a peaceful sleep and thus you will wake up when you are feeling fresh. You should have them washed regularly after every four months as suggested by the manufacturer. To ensure that you will have a great fit on your mattress, it comes with an elastic band which you will use on the side skirt to pull any excess material that is under your mattress. The material used is noiseless and at the same time cool, breathable, waterproof membrane layer and hypoallergenic. The terry cotton is known to be a natural absorber of moisture. I used normal washing detergent to wash it thus, you will not need to buy a special detergent as long as what you have doesn’t contain bleach. You will be able to machine wash and tumble dry using low heat. Avoid ironing it. If your mattress has memory foam, latex, or has innerspring, the cover will not change the feel of your mattress. It contains no PVC, no phthalates, or vinyl and thus, good for use by everyone. 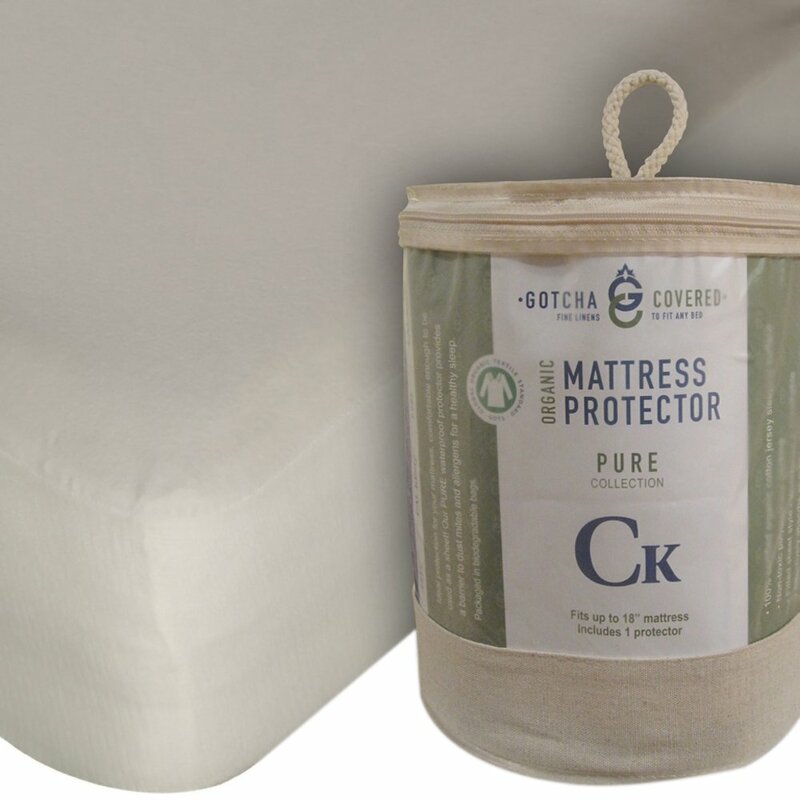 I did test the Gotcha The Pure Collection Organic Cotton Jersey Mattress Protector and it didn’t disappoint much. The organic cotton is soft enough to enable you to sleep directly without noticing that, you are not on a bed sheet. The waterproof is made of polyurethane backing which keeps spills and moisture away from the mattress and also protects you from dust mites. According to the manufacturer’s instruction, it shows that the polyurethane used is inert and thus, will not leach toxins or chemicals meaning, it could be one of the eco-friendly mattress protectors available in the market. It is also important to know something about the company that manufactures this particular cover. The GOTS in the name stands for Global Organic Textile and according to what I read online, it is one of the leading textile processing standards worldwide for fibers which are organic and its main aim is to provide an unambiguous and clear standard for organic textiles, meaning, this particular mattress cover could be a good one. It has a 100 percent organic cotton certified sleeping surface. The technology at work in this particular protector is the Luna Airflow Technology, which allows air to be able to circulate throughout the protector while repulsing with liquids repelled. Its surface is made of cotton terry material, which is hypoallergenic and thus, making it noiseless and you won’t have any change to the feel of the mattress. Naturally, it absorbs moisture and it is a good choice for people who suffer allergies, asthma, and eczema. During usage on this particular mattress protector, the spill test showed its ability to draw in moisture and make sure that it moves away from the surface so that there was no concern that I would sleep in my own sweat during the night. Its elastic corners make it fit the mattress well with no slipping at night when I shifted and turned. You will need to take good care of it and I would warn you against drying and laundering it too often as it will make the material to thin faster. It is recommended you wash it after every 3 to 4 months. 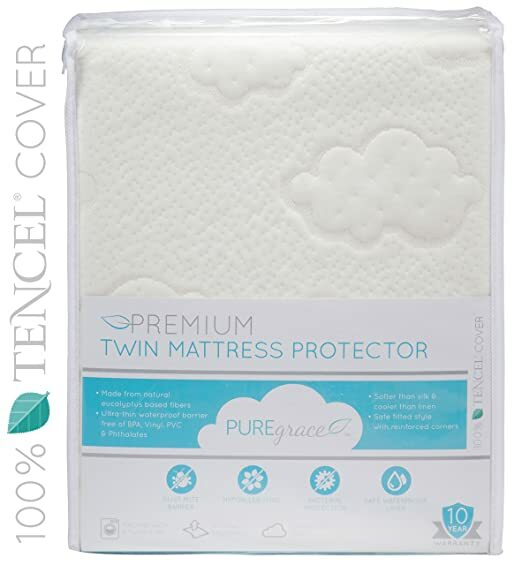 I was curious to test the PUREgrace Twin Mattress Protector because I found out that, it is one of the highly rated on Amazon and I wanted to know what makes it so. According to reviews, it said that the protector contains Tencel, which is a natural fiber that is derived from eucalyptus trees. The eucalyptus based fiber, that is Tencel, will provide you with a luxurious and smooth sleeping surface which is hypoallergenic naturally, thus safe for anyone including a baby to sleep on. It provided me with a softly padded layer that didn’t shrink, didn’t bunch, or lose shape even after I washed it. The pockets are deep on the corners, making it easy to apply on the mattress, adding safety to the same. It is a cover which can fit on a variety of mattress size including crib and twin. Its waterproof properties provides a safe and quiet alternative to one with vinyl layers. There are no solvents, vinyl, BPA, Phthalates, and PVC, meaning that, there is no off-gassing, toxic and dangerous smell, or plastic smell. I comfortably washed the protector in the machine and am sure you would love to have something which you can easily wash. Using mild detergent, you will be able to machine wash and tumble dry on a low setting. The company guarantees you a 10-year warranty. So with this warranty, at least it could mean that the product is quality and that is why the manufacturer has given it a long warranty period. Premium Cotton Terry Cloth Mattress Protector is said by those who have used it on Amazon to be able to keep the bed comfortable and clean for a good night sleep. According to the reviews, there is a miracle membrane barrier which promotes a sleeping environment that is healthy by protecting you from allergens and dust mites which could be hiding in the mattress which include pet dander, mold, pollen, and mildew. The cover is believed to extend the lifespan of the mattress by ensuring that it blocks accidents, perspiration, incontinences, stains, and spills and at the same time, enabling air to keep you cool and dry. It is easy to fit it on the mattress with a fitted sheet style 5 sided protection which securely protects the mattress. The cotton terry cloth fabric is able to absorb any moisture while at the same time, creating a conducive environment to rest. It is said that the mattress cover is FDA class 1 medical device, good housekeeping quality approved after being tested, safety tested and certified by the Standard 100 by Oeko-Tex. The 10-year manufacturer’s warranty could be surety from the manufacturer that, it is a quality product. LUCID is one of the best manufactures of the beddings material market. When I tested the LUCID Premium Hypoallergenic Mattress Protector, I got a confident feeling. I also got excited due to its 15-year warranty because this is above what most of the manufacturers in the market offer for the protector. The most important thing about protectors is for them to be waterproof, and this I did a 10-hour check on it after spilling juice on it in order to gauge its retention of stain and odors as well as the liquid penetration. After the 10 hours, I found no single drop on the clothes I placed underneath the protector. It is hypoallergenic which will help you to rest easy whether you have allergies or not. The material which they are made of, the terry cotton, is comfortable and you will not have to bear with the crinkling sound which comes from plastic mattress protectors. It doesn’t seem to offer the cooling effect that is required during hot nights. If you are not satisfied, the protector comes with a 120-day return back but if you like it, you can utilize their 15-year warranty. Just make sure you take good care of it and use medium heat or cooler when laundering or you can as well tumble dry using low heat to avoid tampering with the waterproof materials. 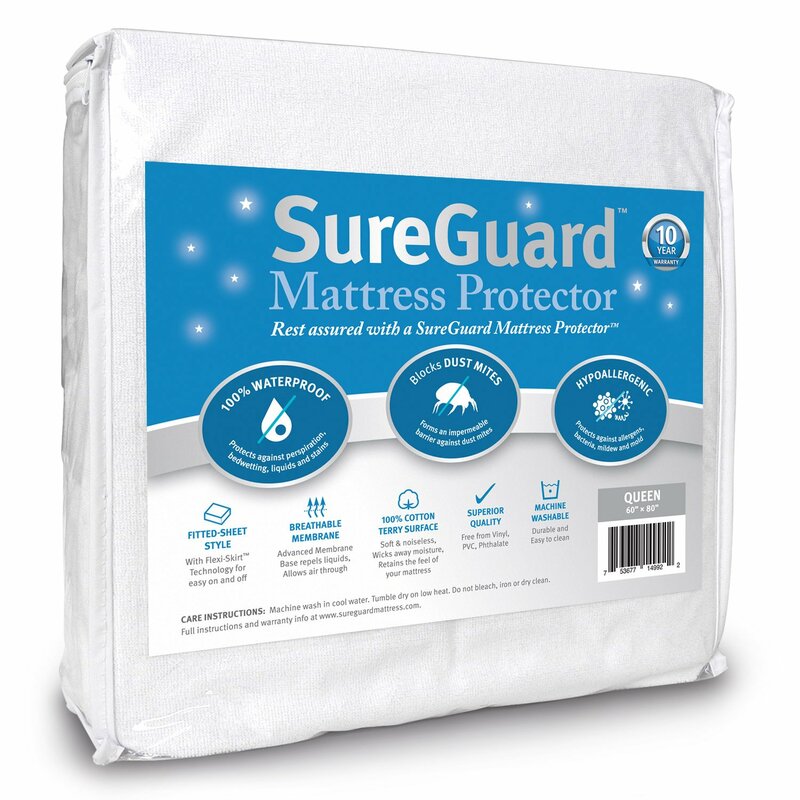 When I tested the Queen Size Mattress Protector by SureGuard, I found out that, it doesn’t have any commotion when you sleep on it. I poured a liter of water and it proved to be a waterproof cover. When I slept on it at night, it gave me premium assurance against sweat. With stains, I tried to pour on it some colored soup and I wiped it out and it remained clean, meaning, you will sleep on a cushion which is clean and crisp if you decide to buy this particular protector. According to reviews on Amazon, I could read about buyers talking about it is hypoallergenic and what it means is that dust, bugs, pet dirt, mold, and buildup will not be able to spoil your sleep on your mattress. Users say that, if you are suffering from allergies, asthma, and incontinence, this could be the cover to buy for your mattress. The film on top repulses fluids, but it is breathable to allow warmth and air to move through which might make it be good for adjustable foam and keep your bed dry and chilled. The workmanship placed in it is not bad and I can say that the manufacturer has really tried to impress the buyers. With the 10 year guarantee, you will be assured that, in case of any issues, you can return or exchange it. You can readily get this particular cover on Amazon at an economical price. Mattress Protector King Size by LinenSpa is recommended that you invest in a quality mattress cover which not only keeps liquids at bay but also keeps you comfortable when you sleep on it. The technology incorporated in the mattress protector king size by Linenspa make it possible for moisture to be pulled away from your body. Based on my trials, it is one of the best when it comes to thinness and softness and it felt like a normal bed sheet on my body. Odors from spills were never retained on it and the color came out immediately I wiped it out after the 8-hour test. The underlayer of polyurethane and cotton cover worked well for me and it created a nice fit for my mattress, utilizing the elastic siding, giving it a tight fit. Compared to most of the protectors, it is quite thin but still a good waterproof. The thinness means that it doesn’t retain a lot of heat and thus, will make you sleep comfortably in case you decide to buy it. According to the manufacturer, the product is supposed to be noiseless, but that was not the case when I tested it. But compared with others, its noise is minimal. It comes with a 10-year warranty which period you can return it in exchange for another one or for money back. Even though it is not one of the top 10, it is still one of the best in the market, that is, according to me. 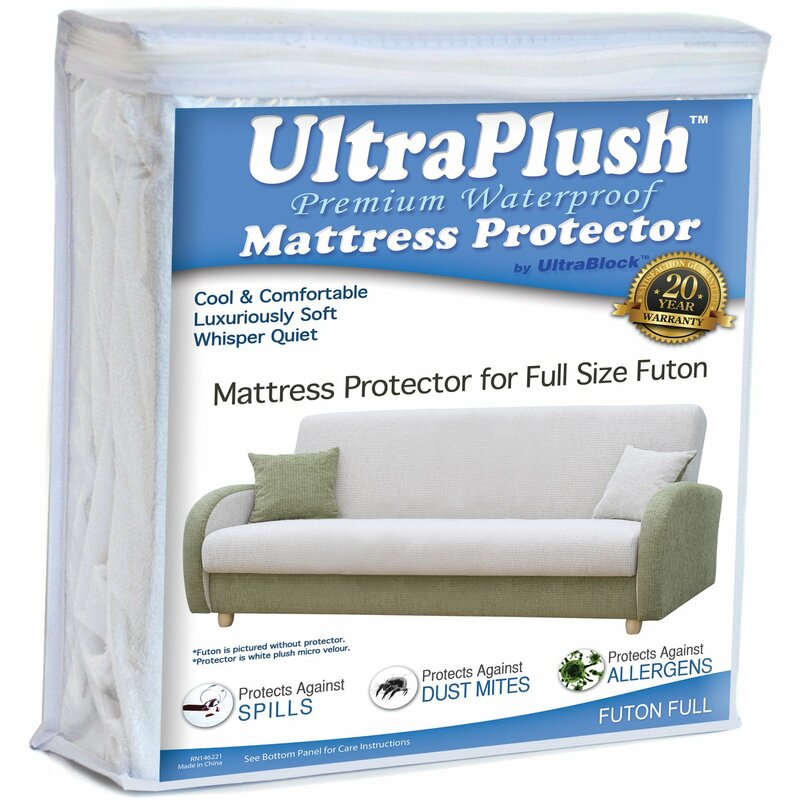 My testing of the UltraPlush Premium King Size Waterproof Mattress Protector made me discover and conclude that the ultra plush premium futon full-size mattress protector is a super soft cover and fully waterproof. I covered it on my mattress and it was able to protect it from fluids and spills. The manufacturer has placed one year back warranty on the product and an overall 20 years warranty, meaning, if you are not satisfied with it within the first year, you can return it in exchange for another one or a refund on your money. Reading reviews on Amazon, I learned that, most consumers who have used it say that it protected them from bed bugs, dust mites, and other micro allergens, thus, it could be a good choice for people suffering from allergic reactions. The material is soft and noiseless and it allowed me to have sound sleep without any disturbing sound whenever I turned. I enjoyed the feel of my original mattress. It is available in a fitted style with various mattresses fit sizes between 9 inches to 18 inches thick. I washed the protector in the machine using my normal household detergent meaning, if you decide that it is the one that you want to buy, then you will find it to be easy to wash it as long as you make sure that the detergent doesn’t contain bleach. The SlumberCool Mat Mattress Protector is a high-cost protector and thus, might not be good for you, especially if you are on a tight budget. But compared to its qualities, it is worth the price. It is more comfortable and thicker than the average mattress protector which incorporates the Outlast technology that keeps one cool during a hot night. I tested it during a hot summer and it actually helped prevent sweating and aided in making me sleep sound. What I found weird with this particular protector is its short warranty of 60 days. But due to the fact that, I found it to be high quality, if you decide to buy it, you might not even need the warrant. When I spilled liquid on the cover, it didn’t soak immediately, and the cover is thick, it kept the juice in place and thus, no draining or penetration through the mattress. The polyester and Lycra material of the protector makes it feel soft and comfortable, but I wouldn’t recommend it to anyone with a mattress thicker than 16 inches. It fits on various mattress sizes. It is a noiseless product and I was impressed with it. I tested the AllerZip Smooth Waterproof Bed Mattress Protector and what I found out is that it could be one of the best in the market. It has superstrong zipper and seams which won’t easily open and thus, the dust mites and bed bugs will be kept at bay if you decide to buy it. I found it to be one of the most comfortable of the various mattress encasement I had tested and this could be due to the smooth fabric which is very quiet when you sleep on it. It also provided one of the best fittings on my 9 inch deep mattress and it could be your pick too as it is available in various sizes to work with most of the beds available in the market. Some of the qualities that made it be one of my favorites after testing is better zipper and strong seam closure which is absent on most encasements. The pillow will be protected from drool without being plasticky or stiff due to the water-resistant material. Compared to its qualities, it could just be one of the most affordable. 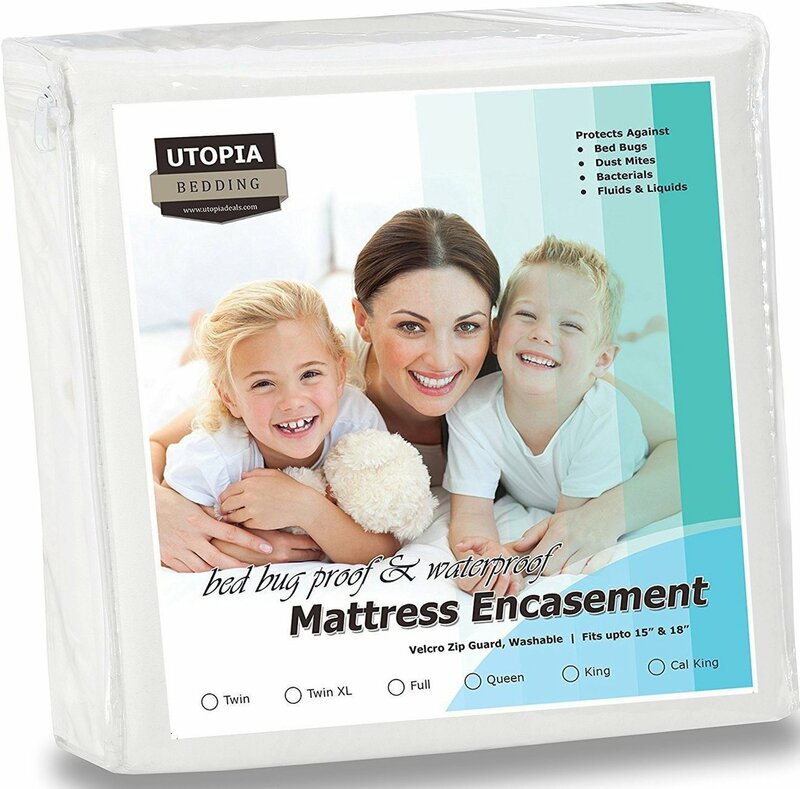 The Utopia Bedding Waterproof Bamboo Zippered Mattress Protector is a queen size mattress liner which can be fit for up to 17-inch deep mattress. It has elastic edges all round to enable it to have a snugly fit. It is made from polyester material combined with viscose rayon. The viscose rayon is derived from the bamboo tree which is naturally and blended to make it cool for the user throughout the night. This particular mattress cover has really extended the lifespan of my uncle’s mattress, which he has been using for the last 4 years. I visited him last weekend and I found the mattress aired outside, looking as good as new and when I asked him the secret behind it, he told me, since he bought the mattress, he protected it using the utopia cover. It provides the mattress with a complete encasement in its stretchable knitted polyester fabric. Apart from protecting the mattress, bed bugs and dust mites have not been a bother to my uncle. It is hypoallergenic and can fit various sizes of mattress. It is machine washable and you can tumble dry on low heat, but you have to avoid ironing it in order to have it last longer. When washing it, make sure that you don’t use fabric softener or bleach on it. If you are suffering from any type of allergy, it could be best to try it out because, my uncle told me that, he is asthmatic and the cover has not caused any side effects to him. But if you don’t like hearing noises when you are sleeping, I will not advise you to go for it, because, whenever you turn, it creates some disturbing noise under your bed sheets. Makes some minimal noise upon movement and thus not good if you are sensitive to noise. 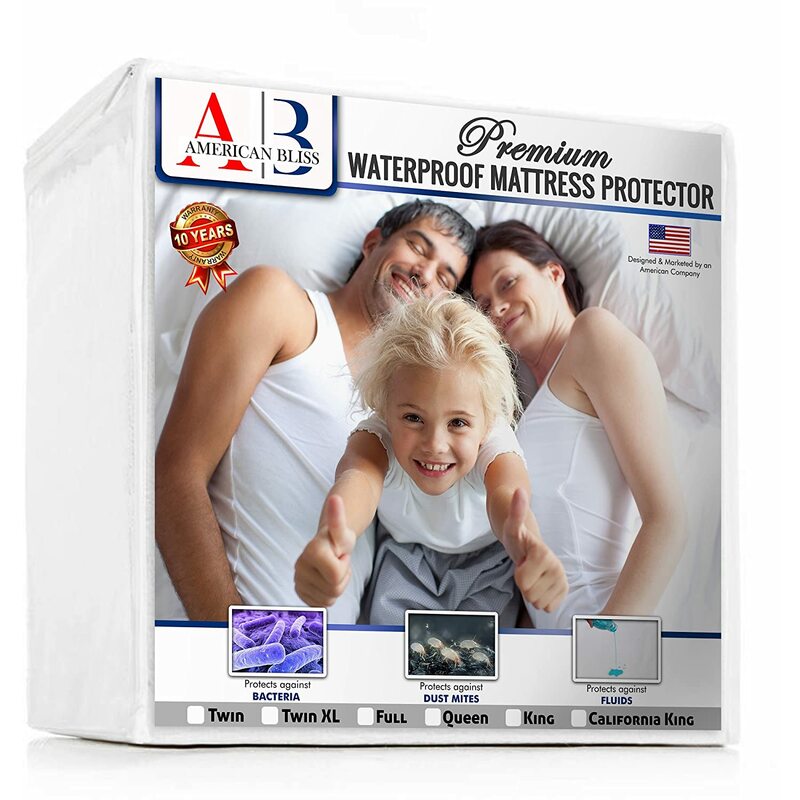 Protector seems to be one of the newest additions to the market of mattress covers. I didn’t have a chance to personally Waterproof Protector American Breathable Hypoallergenic Mattress review it, but I talked to a neighbor of mine who just bought it two weeks ago and he is all praises about it. According to him, the cover protects the mattress against any messes from fluids and dirt and thus, if you have a messy person or one who is a bed wetter, it could be of use to buy it. When he uses it, he says that it has a good feel and you won’t notice that there is an extra membrane you have created on your mattress as it feels the same. Reading online reviews on Amazon, I also came to learn that, it could be a good pick for those people who are allergic or suffer from asthma as it is hypoallergenic. It is said to be free from PVC, vinyl, toxic chemicals and fire retardants. The micro velour material is believed to be softer than the terry cotton, which most covers are made from. You will be protected from dust mites and bed bugs as it has deep pockets fitted sheet style with elastic bands that will make sure that you and the mattress are securely protected. The elastic band is used to ensure that, nothing goes through to your body while you are enjoying your sleep as it automatically pulls any excess fabric under the mattress. When washing, all you require is to machine wash in warm water and rinse it in cold water to retain its soft texture. Avoid using bleaches or fabric softeners. Tumble dry it in low heat and avoid dry cleaning and ironing it in order to make it to last longer. I found the Mattress Protector King Size by LinenSpa to be the best overall amongst all the protectors I reviewed. It is made out of breathable materials which due to allowing free flow of air, it prevents heat and perspiration, and thus, delivering an excellent feel on your skin as you sleep well. The material of the protector makes washing it an easy task. You also have an option of machine washing it using a mild detergent and then tumble drying it. Its zippered enclosure will enable you to counter the bed bugs and dust mite problems. Bed wetters and those who are allergic can comfortably use it due to its 100% waterproof and being hypoallergenic. You will be able to find them in all sizes. Utopia Bedding Waterproof Bamboo Zippered is the best for waterproof protection amongst the protectors for a mattress which I have reviewed. I personally tested it to find out its waterproof qualities. I did pour about 10 ounces of stained water on it and observed it for about 8 hours, keeping tab of the happenings after every two hours. Whenever I checked, I found that the spill was widening as it got soaked into the cover. I lifted the area where the spill was to ensure that there was no leakage beneath onto the mattress and for sure, there was none. It did hold tight and no colored water leaked through even after the 10 hours. My mattress remained protected. 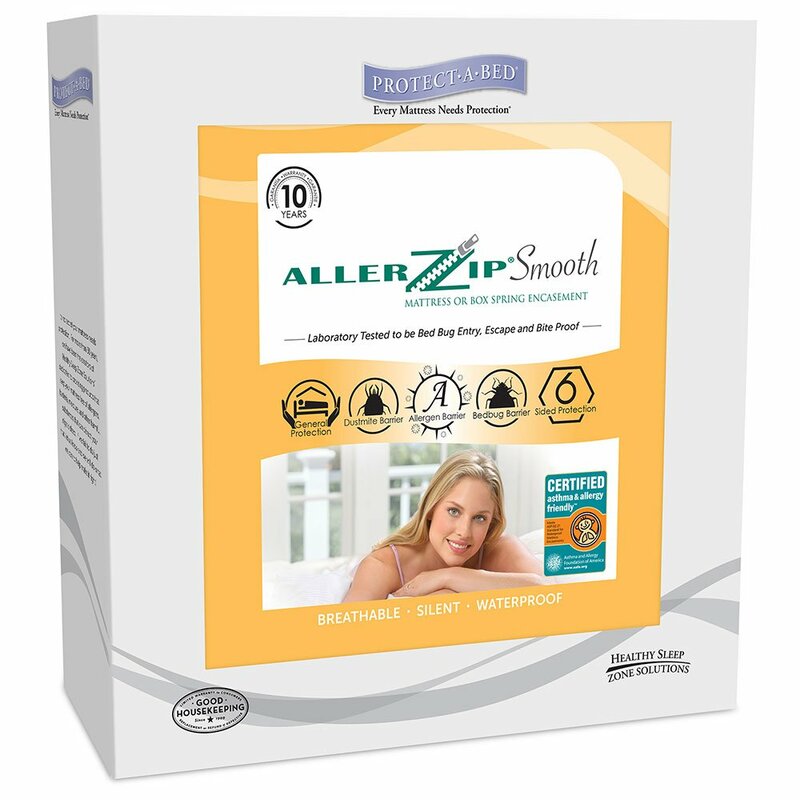 I find the AllerZip Smooth Waterproof Bed mattress protector to be the best for bed bug protection due to its tight fit on the mattress. This prevents any access to the mattress of pests and any other particles of dirt which could create a breeding haven for bed bugs. The zipper system is strong, it is dust mite proof, and resistant to bed bugs. With it, you are sorted completely and thus, you will definitely avoid diseases brought about by bed bugs such as skin related, allergic reactions and insomnia due to being unable to sleep well. 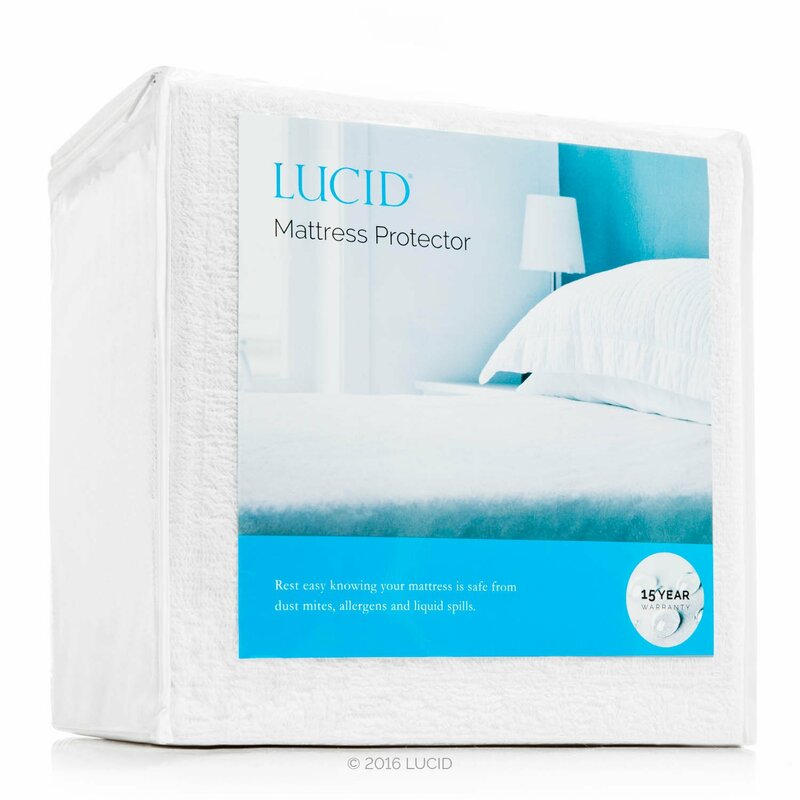 LUCID Premium Hypoallergenic mattress protector according to my reviews is best for allergies and dust mite protection. Though it is hard to tell from my short testing period if it works well or not when it comes to dirt, dust, and allergies, I have a feeling, according to its construction and the reviews from those who have used it for a long time that, it will work. The top layer, which is made of the cotton terry material is soft but not plush as to create a breeding ground for dust mites or bed bugs. The sublayer, which is made of the polyurethane has a feeling of a slick material which would likely resist allergens, bugs, and dirt. It also provides a tight fit to the mattress, especially for those with a box spring. 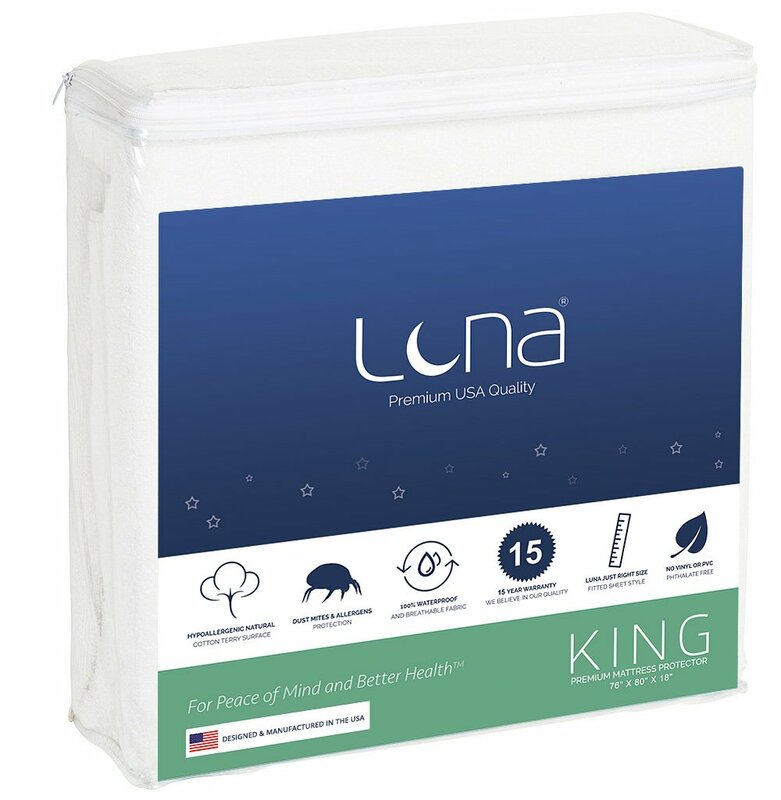 King Size Luna Premium mattress protector seemed to be the best in this field amongst the protectors I tested. I don’t know if it is the waterproof membrane that causes this or not, but I felt fairly warm at night and I can still remember because it felt far more than the rest that I tested. So if you are looking for a protector to keep you warm or you are a hot sleeper, then I highly recommend this one. Because I hate heat while sleeping, I felt its heat retention was high and it really sucked my body all night long. I did sweat a great deal, but the mattress remained dry and nice. Whenever moisture enters into your mattress, its lifespan is shortened as it wears down the foam in it. For the comfortability of the like new feel and also to avoid the spills and moistures voiding the warranty of the same, you will need a protector. If you get one that has a waterproof layer which will be able to keep off the urine, sweat and other liquids at bay, that will be good for you. It will enable the mattress to remain clean and last longer. Studies carried around to show that, a pillow which is more than two years can be a carrier of dust mites and droppings from the same. A mattress also carries up to 10 million dust mites inside it. If you consider sleeping in such an environment, am sure you will be disgusted and because you cannot launder a mattress, it will be best if you use a mattress protector as it is washable. This will make it possible for you to sleep in a clean environment. Getting yourself a mattress protector that is hypoallergenic will be a good idea because it will prevent you from suffering from allergies such as itchy eyes and runny nose. Remember, allergies can make you be uncomfortable while sleeping and thus, wake up when you are feeling tired instead of refreshed. So if you are suffering from allergies, you will need to look for something that will fully cover your mattress and one that has anti-allergen features. The advantage of the full encasement is that you will also be able to protect yourself from bed bugs and dust mites. It is important to note something about dust mites so that, you know why you should get rid of them. They are very tiny, microscopic pests which sleep, eat and live in your pillow and mattress. They feed on the flakes of your skin, which normally peel off. These tiny creatures defecate on your pillows and mattress even though you cannot see it, it is always there. Whatever they excrete has a potent allergen namely, DerP1. So if you have the symptoms of sinus or eczema that seems not to go away, it could be a sign that your mattress is infested with dust mites. If you can get a cotton mattress protector, it will be lightweight, quilted, and machine washable. Most of them have wool, latex, or temperature and moisture-wicking regulating fabrics to improve on the comfortability of the same. A protector that has wool and/or latex, is normally mold and dust mite resistant. You will find them to be durable, firmer and waterproof but not washable. In summer, you are better off going for wool encased in cotton, though an old-fashioned technology, it is the best because of its moisture-wicking qualities. Technologies in some Restonic mattresses such as Outlast, the cutting edge technology, are best for all year round due to the fact that, they regulate temperature instead of just wicking moisture away. If you are among people who suffer from allergies, then I am sure that you are conversant with how much trouble you have to put into the time you take to choose anything for yourself just to makes sure you are comfortable. From hypoallergenic beddings to air purifiers, to allergy medications, you will need to use a lot of money in order to figure out what works for you. But as you search for a solution, you should not overlook the main culprit contributing to your runny noses, headaches, and breathing problems. Note that, you spend most of your time in bed in your house, and it might be the reason as to why you have the symptoms. The allergens are tiny and it might be very hard for you to see them; the danders, or dust mites hiding in your beddings. The following are the features which you will find in the hypoallergenic mattress covers which are available in the market with some having more than one of the features. The guide is to help you in selecting the best for yourself. Even though it is the main one if you are allergic, but not all manufacturers consider it with the importance it requires. You will need to put it as your top priority while shopping for a mattress cover to minimize your allergy problem. Get a cover that fits the mattress tight and is tightly woven thus no entrance of dust mites through porous. You will also need to wash your mattress cover once a week with hot water and thus, if the cover you want to buy suggests that you wash it in warm or cold water, then that should not be your pick. Some people prefer a waterproof cover and put it as their top priority as compared to its hypoallergenic features. So if you are looking for a cover that will protect your mattress from liquid spills and accidents, then waterproof is what you want. It might be that you have a child who is still bed wetting or a family member who is clumsy and tends to spill things all over. To protect the mattress, you will need an effective waterproof cover to make sure that your warranty stays valid and you don’t need to change mattresses quite often. In recent years, bed bugs have become a menace to many families in many cities. They can make you suffer insomnia due to disturbances during your sleeping time. If you get the right mattress cover, it can make you avoid the bedbugs. A mattress cover meant to protect against bed bugs normally has the same properties as the one for preventing allergies. It must be a cover that fully encloses the mattress, nonporous, and have a zipper to keep bed bugs out. Many of the mattress covers on the market will definitely claim to be good for all the aforementioned qualities, but in most cases, it is rare to find them claiming that they will keep you warm. If you live in a place which is cold at night, you can save on heating bills by investing in a cover which keeps you warm at night on contact with your skin to help you have cozier nights. Encasement (Zippered): A zippered or encased protector is one which completely encloses the mattress and it covers both the bottom and the top, acting like a protective glove for the mattress. Fitted: Just the same way a fitted sheet covers the mattress so does a fitted mattress protector. It slides over the edges and corners of the mattress. Elastic Strap: This protector has elastic straps on the corners and it fit over the corners of the bed. Polyester Mattress Protector: Polyester protectors are inexpensive and could serve the purpose if you are on a tight budget yet you need a protector. You can have one with a polyester shell and blend of fabrics or with polyester fiberfill. I like the one with a poly-cotton blend, but my cousin John went for one with polyester-polypropylene blend with vinyl and he tells me it has excellent waterproofing qualities which leaves him a happy consumer. The good thing about this type is that you can get in all the three styles; elastic strap, fitted, and zippered. 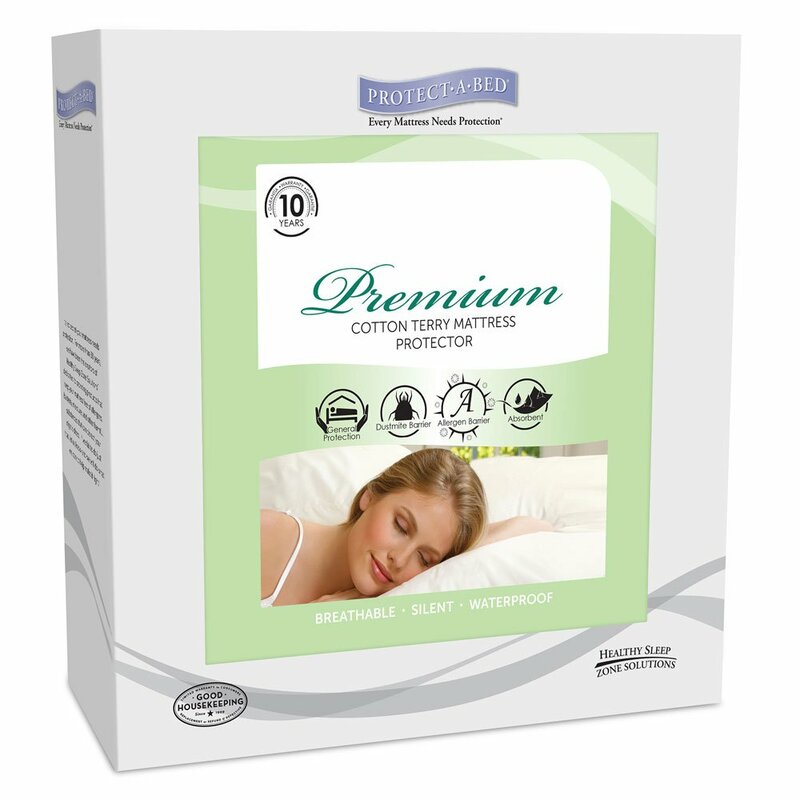 Cotton Mattress Protector: Cotton mattress protector provides the dense feel, which is firm and has hypoallergenic properties and available in various organic types. They are also available in untreated versions with no chemical dyes. To help to guard against allergens and dust mites, you can go for one that has woven fabric. Vinyl Mattress Protectors: It is good for those who have children who are bed wetting and also have severe moisture problems. The vinyl materials are durable and offer serious protection to the mattress, as well as prevent mildew and mold. You will be able to clean the protector by simply wiping it down. Down Mattress Protector: I bought the down mattress protector for my mum and to say the least, she seems to love it. She says it provides her with ultimate luxury and softness. The cover is stuffed with genuine goose down, though there are those stuffed with a synthetic variety. If you have a mattress whose springs are worn down or is too firm, then down mattress protector might be the best choice. Apart from being a protector for your mattress, they will add extra comfort. If you have allergies, then don’t buy the goose down because it has allergens. 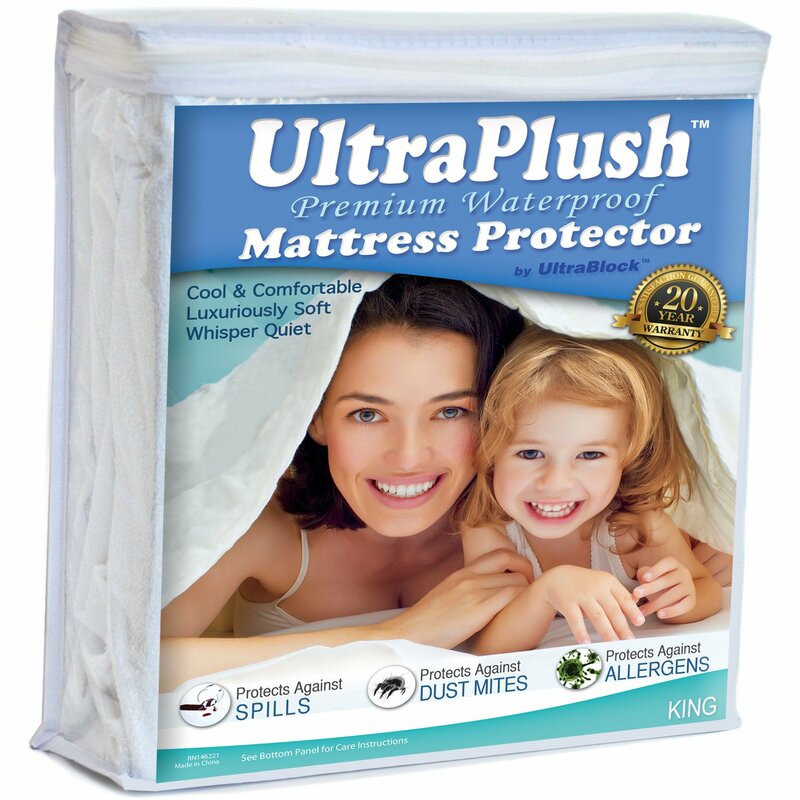 Most protectors for mattresses offer additional padding, comfort, and support. Using them will enable to protect your mattress as you at the same time, enjoy the comfort of the original feel of the mattress. Protectors are available in different sizes: queen, king, twin, California king, twin XL, or crib size. Make sure, depending on the size of your mattress, buy the right size for yourself. Generally, the more functionality, technology, and service the protector provide, the more expensive it becomes. There are simple protectors for as little as less than $50 on the market. You will also come across some specialized protectors which have a built-in technology to help stabilize the body temperature at night and you will get it for above $150. Depending on your budget and what you are looking for in a protector, you will buy the best for yourself. The higher the thread count in the protector, the more luxurious it will feel. So go for the highest thread count that will make you feel comfortable with your budget. How long do you expect your protector to support you? over time, the protector will lose its ability to buffer pressure points. Get one that has a high warrant when it comes to durability. 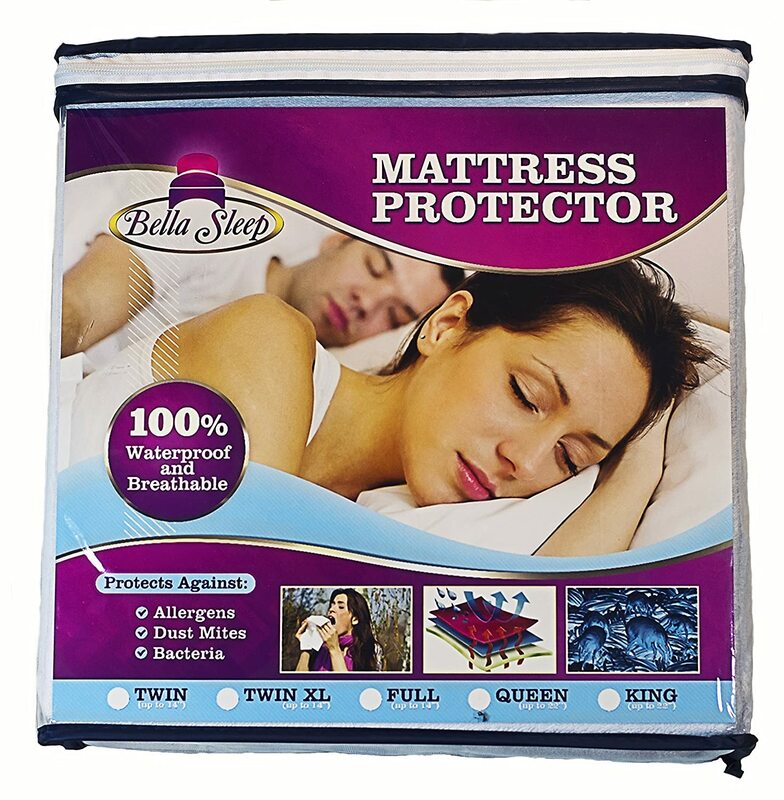 When the protector has a good breathability, it will help to keep the mattress cool. The protector has to either be easy to be wiped down or machine washed. Remember the main reason you are buying it is to make sure that your mattress remains clean all through. PVC/Vinyl is a very common component found in most protectors as they are good when it comes to covering the mattress from mildew and dust mites which could already be in the mattress. So it is a good material protecting the mattress for you and you from the mattress, but at the same time, it comes with its own problems. Volatile organic compounds (VOC) are a toxic material which is found in the vinyl materials. It leaves liquids or solids, turns into the gas at room temperature and circulates in the air in the room. The scents found in most materials are VOCs, but the good thing is that not all of them are poisonous. Peva is also another compound found in plastics, meaning that, the vinyl or PVC materials in the protectors. Even though it doesn’t have PVC, it has vinyl. The VOC off-gassing risk is removed during the removal of chlorine from the material, but that doesn’t mean that it is safe. Peva is the modern method used to give vinyl its property of waterproofing and it has not been tested for a long time. On your foam mattresses, you will see foam in padded like changing table pads. Any protector containing polyurethane foam should not be used by babies because it is flammable and can be dangerous. Phthalates are more flexible as compared to the Vinyl due to the fact that, they are PVC which has been plasticized. They do leach out and offgas the environment and cause issues like cancer, and hormone disruption. If you want a protector for your mattress with minor moisture waterproof properties, then you will have to go for one with wool. Though it scores highly on safety, when it comes to allergic people, it might not be the best option. According to an online research, I have seen that this material is not toxic as such, but iffy thus, not a bad one when you are looking for a protector for your mattress which is not toxic. It has the same content as what is found in most plastics for food storage. But when it comes to washing, it might not be the best as it doesn’t hold up. But for not containing toxic materials, it could be said to be one of the best. It is food grade and believed to be safe as you will get it is used by most manufacturers for babesafe mattress covers. But if you are looking for a washable protector, then it is not a good option, that is, according to Amazon review of the same. So even though it scores highly when you are looking for a nontoxic cover, it isn’t the best on the overall. 1. Are Mattress Protectors Necessary? Yes. Because they help in keeping your mattress warranty in good standing for a longer period of time. You need that because it might come a time when you need a refund or your mattress replaced. 2. Does The Mattress Protector Work For Bed Bugs? Yes. Especially if you buy one that is encased in bedbug barriers. If you ever wake up with itchy, red welts, then your bed is infested with bedbugs and the only solution which could be long-lasting is the mattress protector. 3. How Should I Clean My Mattress Protector? You can machine wash it or wipe it, depending on materials of the protector. 4. Do Mattress Protectors Make You Sweat? It all depends on the type of protector. If you buy one that has some sort of performance fabric on top to wick away moisture and heat from the body, then you will not sweat at all. You can also go for those ones which are breathable and waterproof, but without the performance fabric on top. These ones are a bit expensive and thus, if you are on a tight budget, then it won’t be the best option for you. The cheap protectors are mostly made of plastic materials and thus, not breathable and that means that you are likely going to sweat. You can go for SafeRest protector which, even though cheap, it seems to get a lot of review on Amazon in terms of being breathable. 5. Are Mattress Protectors Safe For Babies? Yes, but you have to be careful about which one you are picking. You should go for one which is made from food grade, vinyl free polyethylene plastic, and BPA free. It should be at least 5 mils thick and proof of it being lab tested should be there. It will help in blocking gasses from transmitting to the baby from the mattress, bed bugs from biting the baby and also dust mites. My best overall pick remains the Mattress protector king size by LinenSpa as it seems to offer all the hypoallergenic qualities that one needs to put into consideration when purchasing a cover for their mattress. It is 100% waterproof; it will keep you warm during those cold nights; it has a strong zipper, thus no problems with dust mites and bedbugs; it is easy to wash as you can machine wash; it will give you a good night’s sleep as it prevents perspiration and heat. So if I were to choose for you what to buy, that is the one I will definitely choose for you. Read through and make a well-informed decision by buying something that will serve you well and a good value for your money.